for the TR5, TR6 & 2.5 PI. This totally replaces the Original linkage and is bushed in phosphor bronze. The linkage has been designed to totally replace the old inferior type. It allows clearance for fitting extractor type exhaust manifolds, whilst remaining underslung and in keeping with originality. The new main shaft is bushed in phosphor bronze with thrust washers on each end bracket, also in phosphor bronze. This gives the ability to adjust end float to a minimum and alleviates all the problems associated with the original plastic brushes. The interconnecting rods are supplied with left and right threaded ends, to which are fixed right angled knuckle joints. These replace the old rods and give accurate adjustment, therefore ease of setting up, far smoother pick up and totally eliminate butterfly flutter. ( Subject to butterfly spindles being in good condition). As described above this kit simply replaces the existing linkage, utilises existing choke and throttle cables and fits to existing throttle spindle ends. It is however advisable to examine butterfly spindles for wear. If worn, new spindles are available from ourselves with or without spindle ends. 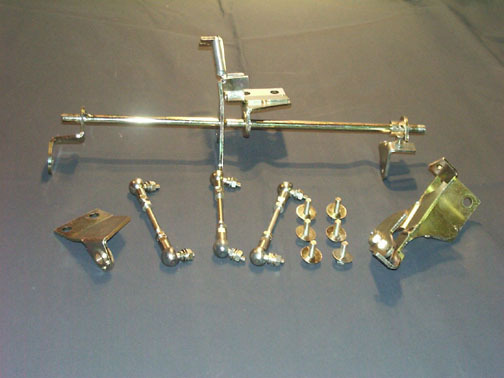 Alternatively reconditioned manifold sets are available on an exchange basis. Fits as CP series kit, however with this kit the throttle spindles and spindle ends are renewed with type normally fitted to rear only manifold. This is particularly beneficial as it allows return springs to be fitted to each spindle and eliminates problems associated with spindle wear. The fitting of new spindles and spindle ends now enables each spindle to be operated and adjusted independently as described in the general description thus alleviating all the problems associated with the CR manifold and linkage. Converted manifolds are available from ourselves on a service exchange basis.